Arthur Henry Kost, son of Henry and Kathryn Kost was born June 14, 1911 at Parkston, South Dakota. His parents moved to North Dakota in 1915. Art went to a country school (Satterlund School #3), about three miles from home with his sisters and brothers. Sometimes it was a task to get back and forth. One winter, a snow storm came and they had to stay at the school all night. When Art was a young boy, he found a dynamite cap and put it in his pocket. That evening after school, he put it on a rock; then took another rock with which to pound it. The explosion blew off parts of two fingers of his left hand. Shortly after getting home from treating Art, the doctor was called again. Art's mother had had a similar accident. Art's brother had found a dynamite cap too, then taken it to their mother to be cleaned out. She didn't know what it was. She placed it on the hot stove, where it exploded. She lost parts of the same fingers that Art had lost on his hand. So, when the doctor was called again, he didn't believe it at first; as he had just come back from the Kost farm for a dynamite accident. He had to be called a second time. Mom Kost, in her own pain, had to then care for a son with a painful hand. Another time, Art's mother had to care for him day and night. When a toddler Art had a bad accident with fire. He was burned badly. It is a wonder he survived. He had bad hard scars on a large part of his body. Yet, he never let anything bother him. He never seemed handicapped by his damaged fingers. He had a good outlook on life. Perhaps it helped him to become the positive and giving person he was. He continued in school even as he grew older, while still helping his dad with farming. Many young men of that era dropped out of school to work with their fathers, out of necessity. Art reached an age when he wanted a car, then a girlfriend. He continued farming with his dad. In time, he wanted a wife. He married Adeline Louise Larson, December 23, 1933. Adeline was the daughter of Hattie Ecklund Larson and Louis Larson. She was born June 7, 1916 at Elm Point (McLean County). They lived on a small farm twenty miles west of Washburn, in the area known as Elm Point, next to the Missouri River. Adeline was the youngest of four girls. Her sisters were Lulah, Alice, and Irene. Alice, never married, (a teacher) died in November 1932 from diabetes. Adeline had three brothers, David, Walter, and Chester. It took time for Adeline and Art to get a home of their own. The little farm close to his folks needed a lot of repair. He and Adeline went over every day to scrape old paint and re-paint, scrub and re-scrub floors. February 20, 1934, Adeline's sister (Lulah) died leaving a two-year-old son. Adeline took care of him. Little Alfred loved his auntie and uncle. Art loved the little guy. So, Art and Adeline started out their married life with an active loving child. They had the heartache of letting him go to his dad (Clayton) and new step-mother (Ora) for a short time. Hard as it was for all of them, they knew it was worse for Alfred. It turned out they had him often. As time went on, it was realized by all that it was best for him to live on the farm with Auntie and Uncle Art, where he preferred to be. Adeline was known as "Auntie" to nearly everyone who knew her. Even today, now elderly nieces and nephews remember her fondly as "Auntie." Art and Adeline were never able to have children of their won. Alfred was the son they never had. His children were their grandchildren. Clayton and Ora Carvell soon had children of their own. Al frequently visited with his growing family of brothers and sisters. Art and Adeline lived on their first small farm for two years, where much was needed. They moved to a better farm for one year. Then, Art's dream began to come true. They moved to the farm Art had always wanted. It was closer to town. The fall of 1936 was a drought year. No money for repairs. House was in bad shape. Winter storms blew right through. Everything that could freeze was put on tables, and chairs pulled up to the stove. The bedroom was closed off. They slept on a cot pulled up to the heater. They had to wear a lot of clothes indoors to stay warm. The other farm buildings were in better condition, and there was a good well with a windmill. Adeline said it was a real treat. In 1941, they bought the farm and were hailed out that same year. The crops were good but lost, and after all the hot dry years! Adeline said, "The good Lord saw us through." They managed, but it wasn't easy. They needed to make improvements to the house. They had the house jacked up in 1943. A full basement, chimney, and furnace were added. The house got a new roof, siding, and windows. It was then practically a new house, nice, but still small. It was modern for 1943. Their family was of different sizes at different times. The home was a second home to many, young and old. All were welcome. Many of the nieces and nephews needed their care at different times. In 1947, Adeline's dad (Louis Larson) lost his home by fire and soon became ill. They took care of him after he came home from the hospital until he died. They were so glad they had electricity, running water, and sewer then. Over the years Art had some good crops and bought more land. He bought new machinery, truck, and car. He raised cattle, sheep, and pigs. They milked cows. Adeline raised chickens and tried to raise turkeys too. One year she had a large bunch of turkeys; the men were in a hurry to finish the brooder house in time for the turkeys to come. One summer night there was a bad storm, and part of the brooder house landed up beside the house. Adeline said they had to dress and go out in the dark to gather up turkeys in boxes, what was left of them. That fall they couldn't go anywhere at night until turkeys stayed where they were supposed to roost. They couldn't even go to town on Saturday nights until after dark. That was the end of raising turkeys. There was trouble with coyotes too, and foxes for a while. Adeline reported that the foxes were worse than the coyotes. One year Art had a large herd of hogs. They were a hazard. Adeline said her sassy geese lost every battle and some of her innocent chickens too. Adeline always had a garden and canned a lot. She always made time for flowers. Art enjoyed the flowers too. Adeline said that things were very scant in their beginning years, that they didn't have much. Art did have a team of horses and a few cows then, and a second-hand tractor (new to them). He used some of his dad's other machinery. He helped his dad too. They had some cattle on shares. As years went on, they had more of their own to work with. More land required better machinery. So it went. They also tried ranching chinchillas. They loved the animals and were doing well with them. But they were too tied down. They felt they couldn't ask a neighbor to watch them. They had many hired helpers over the years. One they had for many years, Herb Brenneise. He became like one of the family. Adeline's sister, (Irene Reimers) had a young son, (Harvey) who became very ill with congenital kidney disease; his parents took him to Chicago in1949 to be seen by specialists. After that, he spent much time in Minneapolis until he got older and went on his own. Adeline and Art felt lost while they were gone to Chicago. Art said that even the radio sounded lonesome. Their home was open to him and the other nieces and nephews. They enjoyed them all. Harvey eventually had three kidney transplants. He died from infections and kidney failure on August 18,1983, at 38 years of age. Art's folks were getting older and Art's dad had several strokes. Mom Kost needed help more often. By then, Art and Adeline had built a new and larger home. They felt they needed a new home. The little house was getting old and needed much work again. Art said he would not spend another nickel on it. The nieces and nephews recall special meals and holiday celebrations in that little house. The adults would eat in the small dining room while the children ate at tables in the kitchen. It was considered a major achievement and badge of maturity when they graduated to seating at the dining room table. Adeline said that she was tired of not having enough room, so a big house she got. They moved in on April 1, 1965. The kids and grandkids helped them move. The grandkids were not very old, but they were so happy that they moved their own toys. The children were excited about all the room, like Adeline and Art. They still love Grandma's house. Dad Kost died shortly afterwards. Mom Kost needed more attention. Things didn't pan out as they had planned. Art and Adeline had little time for themselves. There was little time for entertaining and relaxing (not as they had hoped). Some time later, Mom Kost had to be put into a nursing home. Adeline said they tried to spend time with her as she was so lonesome. Adeline related that Alfred married a wonderful girl, Janet Anderson, a Washburn teacher. Janet had an identical twin, Janice, who married Gordon Rothmann, a Washburn native. 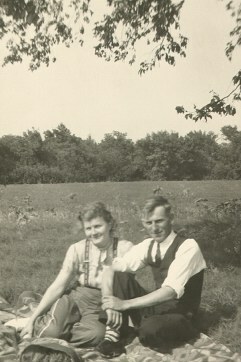 Al and Janet soon had a farm of their own, but Art and Alfred were partners in some of the land and farming operations. Al and Janet had two children, Monte born 1960, and Brenda born 1962. Art loved them so much. They were his shadows. Adeline said that one Christmas Monte wanted an electric train so bad he even prayed for it. Grandpa Art was concerned. He asked questions. In the AM of December 24,1965 or 66, Art disappeared. They guessed he had gone shopping, maybe to Bismarck. In the afternoon, he came home. Christmas was celebrated at their house. Presents opened. Monte was looking for a train and disappointed. Then, Grandpa took him by the hand out into the entryway. Suddenly, they had a happy boy. He had his train. Adeline said she thought that Grandpa Art was happy too. Art was getting older and wanted to cut back on some of his work, but he hated to part with his cattle. One fall he was watching his cattle in the stubble field. Adeline knew how hard it was for him, because he was waiting for the cattle truck. He couldn't part with them altogether, so later, he bought cattle again. He built more cattle barns, more wind shelters, put a water fountain in the shelter. Things were better. He had the pasture. Art's mother took ill at the nursing home; then she was hospitalized. They were at the hospital much of the time. Adeline promised to stay near her. One day, at the hospital, Art went out for fresh air and to stretch his legs. He came back smiling, and asked Adeline to come over to the window to look at a car across the street. He said it was theirs. Mom Kost died a short time later. They realized they no longer had any parents. They discussed how they were suddenly the old ones. That was October 14, 1971. But now Art and Adeline traveled more often. When the car went, they were both in it. Early summer came. Al and Janet rented a camper for them to take a trip up into Canada. Adeline and Art loved Canada. Before they left, Art had men come to install central air conditioning so they would come home to a cool house. Adeline was so glad Art had not listened to her. Apparently she had discouraged the idea. They enjoyed the trip to Canada so much, but Art said he got far behind. He said they were gone eight days, but got sixteen days behind. They were members of NFO (National Farmers Organization). It was very important that they attend state and national conventions. They had plans for a winter vacation in California and Arizona. Art had planted sunflowers the summer of 1972. That was the first sunflower crop in the western part of the state. As they grew and bloomed, Art and Adeline enjoyed watching the cars driving by and stopping half a mile away, then someone trying to pull off a sunflower head. Adeline said that they do not just pull off! People would try to pull the plant out by the root too. Maybe some succeeded. Adeline and Art didn't have a grain drier at that time, so Art had to wait for them to freeze dry. Then, he had to haul the crop over to the Cathy area. He had just finished hauling them over there when they left for Kansas City for the national convention of the NFO. When they got back, it was near Christmas. They had to finish Christmas shopping. Art and Al were hauling grain to be delivered to Coleharbor. There were some icy spots on the highway. Adeline considered Art a good driver. But, Al and Adeline were worried when he didn't come home as expected. Al had taken another load to deliver when he learned of Art's accident. Art was killed December 20, 1972. Adeline regretted that they'd never had the leisure time together that they'd planned. They had spent much of that last year helping his mother. They thought they would have time later for themselves. Things were getting better for them. Art had a new modern combine with an air conditioned cab, other new machinery, new truck, and pickup. They were still working hard, but not sorry because they were busy. They had dreams of doing more. Art had two light strokes earlier. Adeline said she wondered if he may have had one while driving. Art had started smoking at a very early age. Adeline was unhappy about his smoking. But, several years before he died, he stopped. After that, he was very fussy when someone came and smoked. He would empty ash trays as soon as people left the house, opening doors and windows to air out the house. No one in the family smoked. Adeline urged folks, "Please stop smoking young people--if you smoke. It is best for you and those you love." One spring, Art had an accident with a tractor and plow. He got his hand in the wrong place. Adeline was shocked when she saw him with all that blood. She drove him to the doctor. They were both very shocked when the doctor said he would try to save the hand. It took a long time and a lot of trips to the doctor and a lot of medication before his hand was healed. Adeline said his stomach was never the same after that. She was afraid that if he had lived and gone for a complete examination he may have found out something he wouldn't have wanted to hear. Here is a little story that Adeline wrote: " In one of the earlier years of our marriage, Art and I were milking cows one morning. It was my birthday. Art had forgotten my birthday so he promised me one of the young pigs; the one with the shortest tail. He didn't know which one it was. We were anxious to finish our milking, separating, and feeding the calves before we went to the hog barn. The cutest little fat pig had the shortest tail. We had a lot of fun that year watching the little pigs grow and mine grow to be a nice little sow. She was kept for breeding stock. It is a memory I shall never forget. Nice memory. Can still remember Art's face as we hurried to finish the chores." After Art's death, Al and Adeline had to hire another man to take Art's place. They had all those cattle. Adeline said that when the power plant was built near Washburn, wage competition became too much. They had to sell the cattle again and go to grain farming. Al and the hired man, of long standing, got more acres. They rented out the pastureland. Al and Adeline continued to live on the farm. They had people live in the little old house so Adeline wouldn't be alone on the farm so much. She did well alone, yet was lonely, but determined not to bother her kids too much. She had her car and went to town every morning to get the mail and have breakfast with widow friends. Adeline became gravely ill with ovarian cancer in 1987. Surgery and chemo therapy followed. Later, she said, " Now I live in a nursing home in Bismarck. It will soon be a year here, but I love it. In 1990, Al and Janet moved up to my house--which pleases me. That is the way Art would have wanted it. His grandchildren play and feel at home there. Art was a Christian man. Looked to God for his strength and help in time of trouble." Art and Adeline had both been members of the Baptist Church in Washburn. Their faith in God was steadfast. The nieces and nephews recall that Art saying Grace before each meal seemed as much a part of their lives as breathing. Monte and first wife, Cindi, were divorced. Monte married Victoria Kramer. Brenda's husband, Andrew, died. There were no children of that union. Adeline died June 10, 1993. She and Art are both buried at Riverview Cemetery near Washburn, North Dakota.